Provençal physician, astronomer, and grammarian; lived at Beaumes toward the end of the fourteenth century and at the beginning of the fifteenth. He was the author of: "Shib'ah 'Enayim," a treatise on grammar and on the Masorah; "Shib'ah Mizbeḥot," a treatise in verse on astronomy; "Zeh Ḥelḳi mi-Kol 'Amali," a treatise on the immortality of the soul; and "Af Ḥokmati," his last work, and the only one that has been preserved (Bibl. Nat., Paris, MS. No. 1196), being a medical treatise divided into seven parts entitled "Shib'ah Shibbolim," each of which is accompanied by a commentary entitled "Erek Appayim." 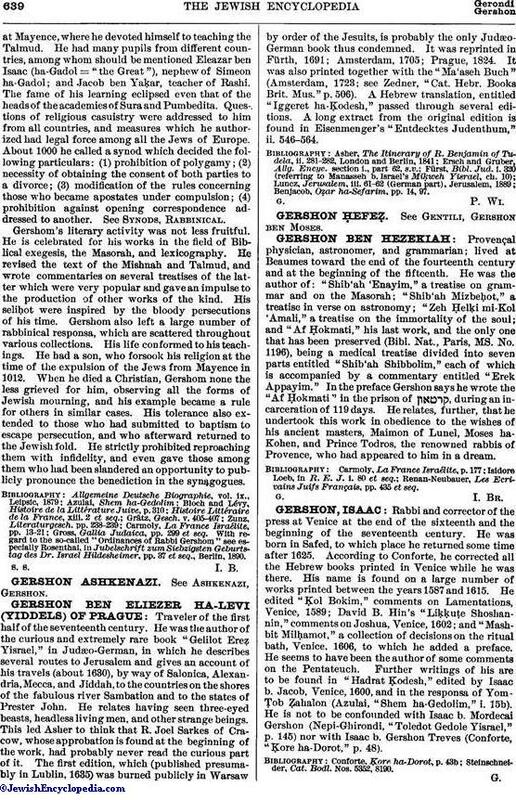 In the preface Gershon says he wrote the "Af Ḥokmati" in the prison of , during an incarceration of 119 days. He relates, further, that he undertook this work in obedience to the wishes of his ancient masters, Maimon of Lunel, Moses ha-Kohen, and Prince Todros, the renowned rabbis of Provence, who had appeared to him in a dream. Renan-Neubauer, Les Ecrivains Juifs Français, pp. 435 et seq.